Ships from and sold by IncubatorWarehouse. 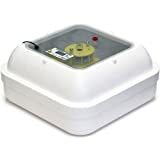 Sold by Magicfly and ships from Amazon Fulfillment. 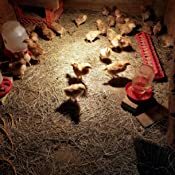 Sold by Avianweb and ships from Amazon Fulfillment. 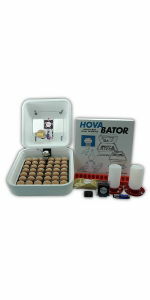 The HovaBator Advanced Egg Incubator Combo Kit includes the fundamental items needed to start incubating. 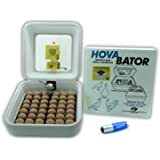 In this kit you will receive a HovaBator 1602N incubator with an Incubator Warehouse installed fan kit, an IncuTurn automatic egg turner, and an IncuTherm thermometer/hygrometer. 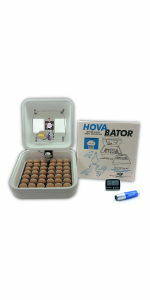 With these items you will be started on the path to a great hatching EGG-sperience. Overall Dimensions 18" x 18" x 10"
Similar to how eggs are turned in nature. 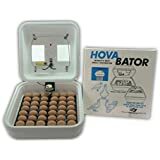 5.0 out of 5 starsPerfect Hatching Incubator!! 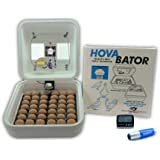 I have never owned any other incubators and thus I don't have much to compare it to. If you are going to provide a fan, why not go ahead and mount it. The instructions for mounting the fan confusing. 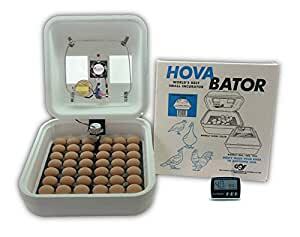 I like the fancy digital thermometer, but there is virtually no where and no way to mount it on the egg turner in the middle of the incubator. It fell off continuously. 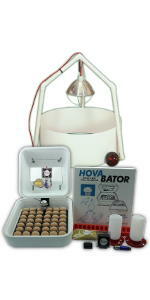 It is also almost impossible to read the thermo in the incubator. I should not be forced to purchase an after market product so I can read the thermo on the outside of the incubator. Why tape a worthless analog thermometer to the bottom of the incubator? The thermostat was not very helpful if the outside temperature changed much, you have to keep adjusting and adjusting. and easy as pie. 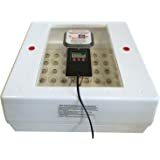 Start the incubator a few days prior so you can fiddle to get the temp and humidity just right, but after that it's simple. 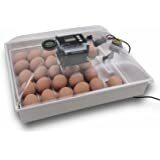 I highly recommend the egg turner so you don't have to obsess and worry about doing it right! 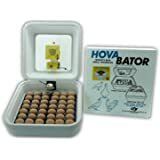 I highly recommend this incubator. 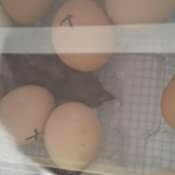 I am a first-time egg hatcher but by following the directions that came with the incubator, we successfully hatched 17 out of 20 eggs. 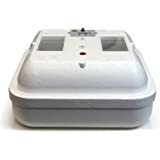 The unit comes with both an analog and a digital thermometer, but I would recommend you get a third thermometer you know is reliable and calibrate the other two with it. 1.0 out of 5 starsSkip this one!!! Don't waste your money! The 1588 is not much more and a lot better quality. 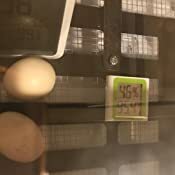 Even with the fan kit this incubator has hot/cool spots and no troubleshooting has solved this. 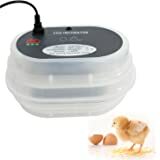 Save your chicks, save your $$, and go with a slightly more expensive incubator. You won't regret it. Even attempting a return has also been a giant headache with this seller. My therm/hygros are all calibrated as well and it has shown these temp differences with up to 5 different units inside to test it. Beyond frustrated! Put it together the night I got it. Plugged it in and adjusted the temp. The temp holds great. The humidity on the other hand is crazy. I've had to add water every day because the pan is bone dry when I get home. Another thing is the turner is not working. It's plugged in but it does nothing. 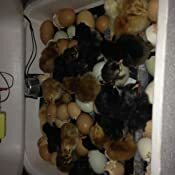 I had to hand turn eggs last night and tonight. I will probably have to look for a turner this weekend. 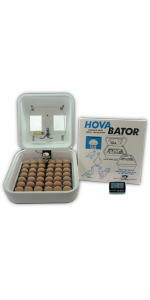 That was the whole reason for buying this incubator and not a smaller package one. Edit: if you use the 4th tray instead of the 1st one the humidity holds steady in the 30's without having to put water in every day. 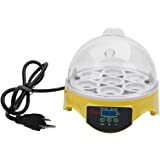 I did end up buying a different egg turner that works great.